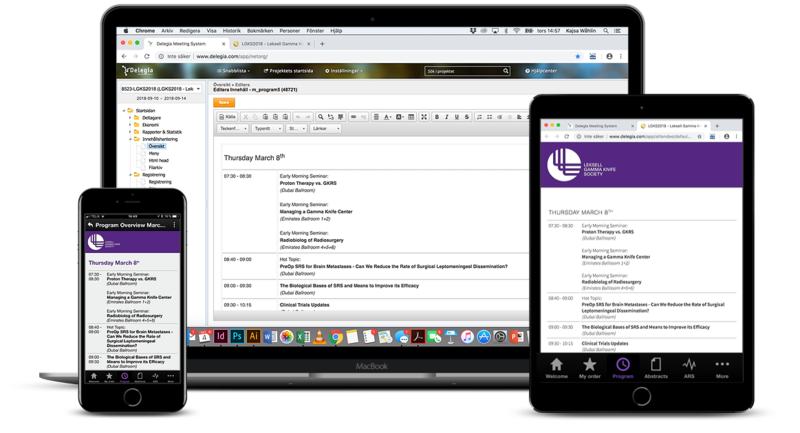 ”At Delegia, we believe that conferences, events, congresses and exhibitions should run smoothly and without irritations, most particularly regarding registration, marketing and follow-up. Our principal activity is focused upon the factor that constitutes the foundation of all well executed meetings; the registration. You form the basis for an effective and well managed event with a great booking system, taking in all the parameters concerning payments, rebates, finding the right hotel for the right person and so on. When Michael Westerberg, our Chief Technology Officer (CTO), started the company in 2001, the whole operation was built around his proprietary digital system, Delegia Meeting System. Michael had worked previously as IT Manager and project manager at Stockholmsmässan International Fairs. He had seen for himself what was lacking in the meeting industry and thus preventing the organisation of successful meetings. The booking system is the basis of Delegia’s success today. We are often involved with meetings where high standards are required regarding advanced logistics and a competent system for the effective management of everything; from registration, hotel reservations and payments, to follow-up and evaluation. We are continuously developing our own IT-solutions, to complement and extend the system, so that our customers gain full control of their event, and are thus able to create effective meetings. Our people possess experience and extensive knowledge. They have previous experience of the meeting industry, event production, IT-support for expos and also from conferences and the travel business. We also involve students and newly qualified IT collaborators in our operation. It is thus that we create a powerful mix of experience, recognition of needs and development of new solutions. Delegia AB är ett svenskt bolag som grundades av ITmaskinen 2002. Bolaget säljer ett egetutvecklat bokningssystem som förenklar och förbättrar allt kring anmälan, marknadsföring, registrering och uppföljning i samband med kurser och konferenser, kongresser, mässor och event. Vårt system används i dag av arrangörer världen över. Vi ingår i koncernen ITMaskinen Sverige AB tillsammans med.